...by the way the Vodka boxes in Gregg's office aren't there because he's taken to drinking. 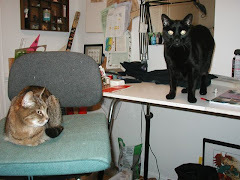 They are there because I'm packing up his office (and mine) so that I can paint. Yeah, I'm sure your right. It's a big dog conspiracy. Cats have a similar one. They have parties and drink all your beer while you're out of the house but get rid off all the evidence before you get home. Sneaky. I have to respond to Jean about buying crazy dog items at Tuesday morning. It is my favorite store. In one weekend here in Sunny California I vitied 3 different Tuesday morning locations. I have found 2 wonderful dog collars studded with red and the other Blue Jewels on the collar. They even had a leash to match! Uh oh --shopping obsession kicks in and I've bought 600 thread bed sheets, gorgeous comforters, draperies for the windows, towels so soft one can ony plunge their face into the wondeful Egyptian cotton. Then there are the sweet dream pillow top mattress covers, oh..then they had 3 beautiful Waterford vases that I just had to have them. Originally $185. on sale for $34 each! Candles so nice that they belong in a Marrikesh tent! Too many things to mention. I promised myself I won't go back to Tuesday morn until I win a lot of money in Las Vegas. Ray - by the way..SuperDog gives his regards. It's rufff shopping at Tuesday morning! !